Introducing a new cat or kitten to your resident cat or dog can be quite challenging. You want them all to get along, and you want your current pets to welcome your new cat into the house, but it isn’t always so easy! 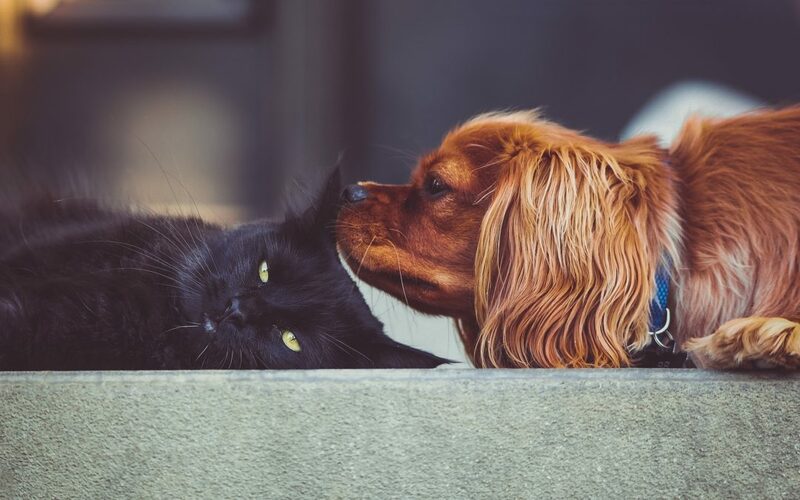 As passionate pet owners ourselves, our team here at Anasazi Animal Clinic in Gilbert understands that careful introductions can help smooth the way toward a successful meeting. In our last post we discussed the first phase of the transition, so be sure to read and follow those steps first. In today’s post, we will discuss the next phase of introducing a new cat to your current pets: the face-to-face meeting. Once both cats are eating and using the litter box normally (see the steps for the first phase), you’re ready for the next step! First, put a gate across the door that has been separating them, and then open the door so they can see and smell each other. A baby gate works well, but you may need to stack two on top of each other so the cats can’t jump over them. Continue feeding the cats on either side of the gate until they can eat calmly in each other’s presence. Again, once they are each eating and using the litter box calmly, then you can take down the gate(s). They may hiss or swat at one another, but at this point the familiarity that has already been established may help to calm their reactions. Cats often will work things out on their own, but if they have a fight and one of the cats is traumatized or injured, then the match may not work out. If they seem to tolerate or ignore each other, then it is a good match. In time, they may even enjoy each other’s company! At least initially, whenever you need to leave the house, it’s always a good idea to separate the cats. After you are certain they’re getting along, you can leave them alone together. After your new cat and resident dog have become comfortable with eating on opposite sides of the door and have been exposed to each other’s scents as discussed in the last post, you are ready for a face-to-face meeting. Restrain your dog with a leash and have him sit or lie down. Another family member or friend will need to sit with the cat on the opposite side of the room, but they should not physically restrain her. Have this person calm your cat with treats or catnip. Keep the dog-cat visits short but frequent. If your dog becomes uncontrollable, then it is time to end the visit. Repeat this step several times, until both the cat and dog are tolerating each other’s presence calmly. Next, with the dog still on-leash and in a “down-stay” position, allow your cat to freely explore your dog at her own pace. Give your dog treats and praise for him when he is calm and in this position. Positive reinforcement is the key for a successful match. If your dog only associates the cat with being punished, he may act aggressively toward her. If your cat runs away or becomes aggressive, you’re moving too quickly and you’ll need to start again at the previous step. Directly supervise all interactions between your dog and cat. During this phase of the introductions you may want to keep your dog on-leash and with you whenever your cat is loose in the house. Be sure your cat has access to a safe place to hide. And keep your dog and cat separated when you aren’t home—until you’re absolutely certain your dog will not harm your cat. If you have more questions or concerns about the process of introducing a new cat to your current pets, contact us at Anasazi Animal Clinic in Gilbert. And as soon as possible, be sure to bring your new cat in for her initial appointment with us. Good luck with the transition, and enjoy every moment with your new fur baby!